Vince Flynn is back. Mitch Rapp is back. All is good except that I flew through Rapp’s latest adventures and now have to wait another year for the next installment. First of all best wishes to Mr. Flynn and continued healthier and healthier years ahead. Second of all the fight with cancer did nothing to his writing skill. In Kill Shot Flynn takes us back to the early days after Rapp was first unleashed on the ugly, evil terrorists that plague the world. This battle takes place in Paris (France not Ohio) when Rapp get’s a not so nice surprise putting his life at risk. We get a closer look at the development of the relationship between Rapp, Kennedy, Stansfield, and Hurley and their secret “division” of the CIA. I thoroughly enjoy this peak back and hope that we are treated to more of the younger Rapp in future novels. I find it harder and harder to come up with new superlatives for Flynn’s novels. This one grabbed me from the first page, held me, and wouldn’t release me until the final page. Thank you Vince Flynn for giving me such a pleasurable few days. Maybe someone can tell me why any of Flynns’s novels has not been made into a movie. Jason Bourne has nothing on Mitch Rapp. Maybe Hollywood just doesn’t need more hits. Do yourself a favor and pick up a copy of Kill Shot only do it on the weekend so you can stay up late and read. This article was published on Feb 11, 2012 . 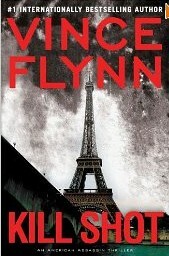 It is tagged cia, kill shot, mitch rapp, novel, paris, plague, terrorists, vince flynn. You can follow any responses to this article through the comment RSS feed.